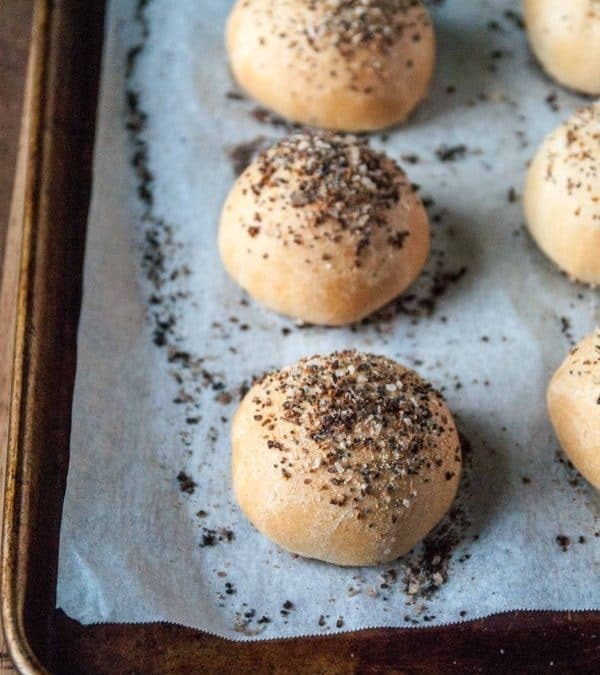 Looking for the ultimate vegan dinner rolls? These are easy, quick and topped with a perfect everything topping! After a heavy and intense week last week, I decided to ease myself back into the recipe testing routine and started in a good place—with carbs. I’ve been on the hunt for a quick and easy vegan dinner rolls recipe for the last year or so, ever since I made a small Thanksgiving dinner last year. I searched around for a while (like weeks) for a vegan dinner roll recipe that wasn’t going to take all day/overnight and wasn’t full of vegan butter, which I’m not totally a fan of. After not really finding all the things I wanted in a vegan dinner roll recipe, I decided to set out and make my own. I tinkered around a bit and found that a quick rise yeast and hearty dose of Bob’s Red Mill whole wheat pastry flour made for a perfect combo, lending itself to a tender, easy roll that takes just 2 1/2 hours from start to finish. One of the main reasons I wanted to come up with a quicker dinner roll recipe was because, if you are like me, you’re impatient and can’t quite get with the thought of waiting 4+ hours for dinner rolls to rise. I will specify that quick rise yeast is best here thanks to its fast acting properties and tendency to make for a better rise. Also, make sure you don’t skimp on the whole wheat pastry flour! I know it would be tempting to use regular ol’ whole wheat flour, but the difference between the two can make a huge difference in your end baked product. Whole wheat pastry flour has less gluten and more starch than the whole wheat counterpart, lending to a more tender baked good and a higher starch content. 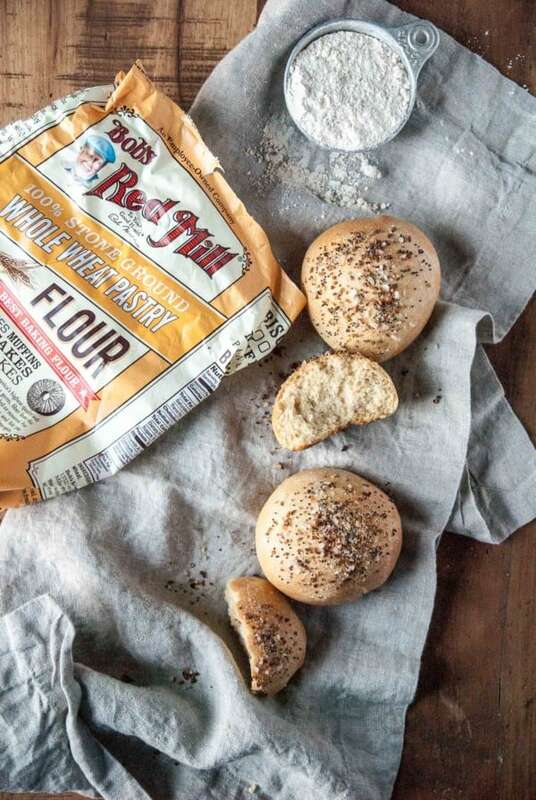 While whole wheat flour is wonderful for heartier baked goods, vegan dinner rolls are where you want to pull out the pastry flour and get to work. To me, the topping on these vegan dinner rolls is not optional and adds just a little extra something to an otherwise plain Thanksgiving standby. 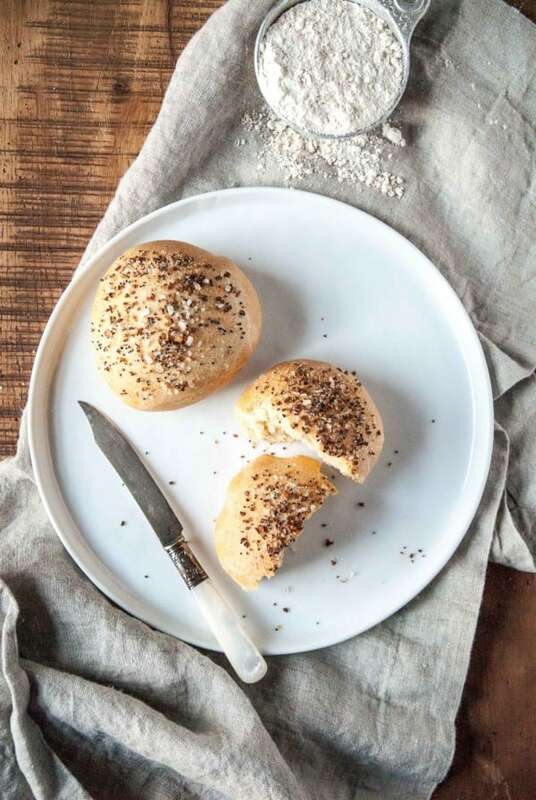 Everything bagels are my all time favorite, so I didn’t hesitate one bit when I sprinkled these dinner roll beauties with a hearty dose of everything seasoning. Honestly, we’ve been eating these straight up, no toppings or condiments required, but I’m betting they would make excellent small sandwiches in the days after Thanksgiving dinner. The key to making homemade dinner rolls is to give the yeast enough time to work its magic. The first step of this dinner roll recipe is arguably the most important; you need to add the yeast to warm water (about bath temperature, you don’t want the water to be too hot!) and mix it in with some sugar and let it rest until foamy. What you’re doing here is activating the yeast. When the mixture goes slightly foamy, that means the yeast is alive and well (i.e. your dinner rolls will rise properly and taste good). Once the yeast has been activated, you can add it to the rest of your ingredients and mix everything together in a stand mixer. 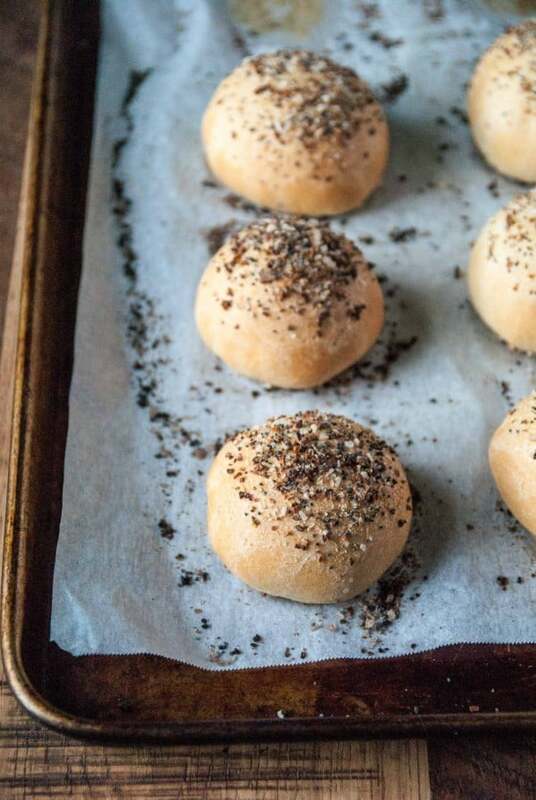 These vegan dinner rolls feature what’s called an enriched dough. That just means there’s more to this dough than just flour, yeast, and water. Olive oil and almond milk make the dinner rolls extra fluffy and add even more flavor to them. Enriched doughs may require extra kneading to properly activate the gluten in the flour, but if you’re using a stand mixer the entire process will go by quickly! When baking these homemade dinner rolls, you’re looking for the tops to turn golden brown and for them to puff up slightly in the oven. These rolls likely won’t expand too much in the oven, as they’ll have had plenty of time to rise on your countertop. What are your Thanksgiving plans? Tell me! My family always goes out to eat and tends to spend the day parktaking in wine drinking, but this weekend my husband and I are having a few dear friends over to celebrate early. With the industry they all work in, it’s hard to get everyone together at once, so I’m taking advantage and serving a small pre-Thanksgiving/Friendsgiving dinner this week. I’ll be posting the dinner I make and links to the recipes next week, so hopefully it will be of some help if you are a last minute planner or looking for that perfect recipe to round out your menu. I’ll be back later in the week with one of my favorite pies yet (!!! ), so don’t miss out! Looking for the ultimate vegan dinner rolls? 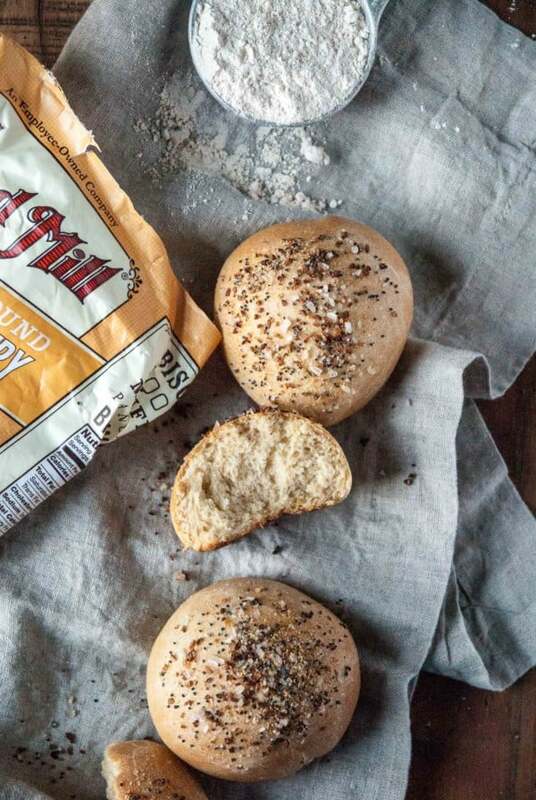 These rolls are easy, quick, and topped with a savory everything bagel seasoning! In the bowl of a stand mixer, stir together the yeast, warm water, and sugar, until yeast is dissolved. Let sit for 2-3 minutes, until the mixture becomes foamy. If it is not foamy, discard the mixture and try again. Yeast should be alive and foamy when combined with warm water and sugar! In the bowl of a stand mixer fitted with the dough hook, place the yeast mixture, olive oil, milk, flour, and salt. Combine on low until dough starts to come together. If dough seems very sticky, add an additional 1/4 cup of all purpose flour. Continue to knead dough in the stand mixer on medium for 4-5 minutes, until dough becomes smooth. Transfer to a bowl lightly oiled with additional olive oil and cover with a kitchen towel. Allow to rise for 30 minutes, until dough has doubled in size. While the dough is rising, lightly grease 2 round pans (pie plates or cake pans) and set aside. Remove the dough from the bowl and divide in half, divide each half into 8 equal pieces and roll each into a ball. Place 8 rolls into each round pan and lightly cover with a towel. Allow to rise in a warm for another 30 minutes, until rolls are light and fluffy. 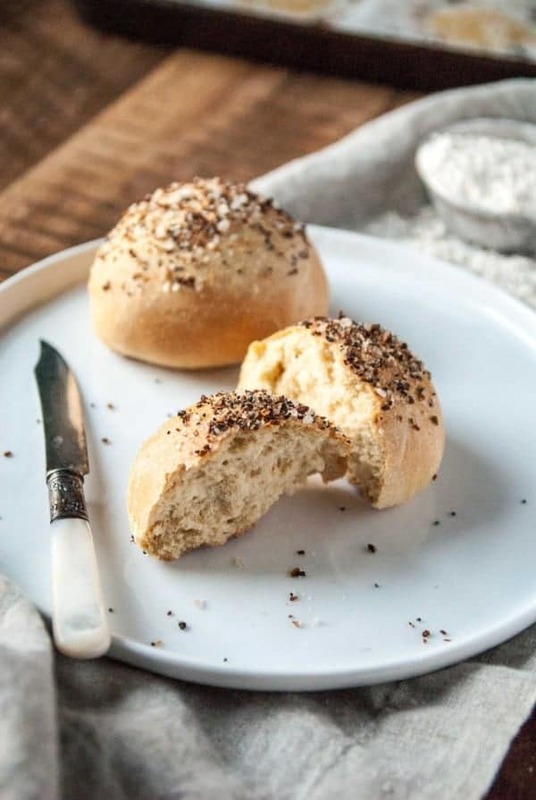 While the rolls are rising, prepare the everything topping by combining the sesame seeds, poppy seeds, garlic powder, onion powder and sea salt together in a small bowl. After the rolls have risen, preheat the oven to 375 degrees F. Brush the tops of the rolls with the 2 tablespoons olive oil, then sprinkle with the everything spice mixture. Bake for 20-22 minutes, until rolls are golden brown, but taking care not to burn the tops. These look fantastic! Actually been looking for something similar for a while and can’t wait to try it. Vegan food can feel so great but I was concerned about getting enough protein on a vegan diet. If anyone is thinking about trying a vegan diet, particularly building some serious muscle while eating super healthy, this website gave me some great ideas http://experimentalvegetables.com/how-to-build-muscle-on…/ would love to know what you think! Last week was definitely intense. I’m glad you found comfort in the kitchen. I’m a sucker for dinner rolls, and I love that you topped them with everything seasoning. The best. YES! That’s such a great idea! Oh my gosh, love this. I can finally take my love for everything bagels and carry it all the way to dinner time! 🙂 Need to try these soon! Yes! I’m right there with you Karly, I would just eat them all day! Made these this morning to go with lunch. The directions were easy to follow and the results were outstanding. Thank You.